Here at FOTL headquarters we're pleased to announce a couple profile-raising media events of late. 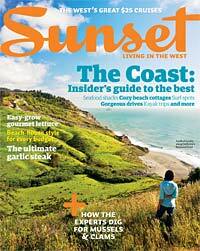 First, check out the September issue of Sunset magazine: "Digging for Dinner," page 80. The eight-page spread will tell you all you need to know to embark on a West Coast clamming adventure. Second, take a peek at Daniel Klein's latest webisode (#68) of Perrenial Plate, featuring seaside foragers Hank Shaw and yours truly, oyster farmer John Adams, and Herbfarm chef Chris Weber. Here's what you don't see in the video. Earlier in the morning John, Daniel, and I dug for a truly stupendous geoduck near the low tide line only to be thwarted by its depth, the seriously vacuum-sealed nature of its lair, and the inexorable force of the rising tide. This was a bummer because it was a BIG clam and I think we all had visions of grandeur before the harsh reality of a failed dig set in. So we regrouped farther up the beach and ran into a whole new host of problems, including a nasty substrate of broken oyster shells and then the coup de grace captured on film... Really, I thought the miserable sound of crunching wood—a broken shovel—was the death knell. Tune in to find out what happens. Just got the magazine and the article is great. My husband and I are planning on taking your shellfish foraging class. Love your book, by the way. Dug clams with the parents at Pismo ages ago, and now I can't wait to give it another shot. Hazzahs and high-fives all around!! And don't forget you're going to be a celebrity speller (mis-speller?) at Seattle's Richard Hugo House on 9/15 at 7:30 pm. Awesome to see you on the show! Especially since I'm pretty sure that I never knew what a geoduck was until I read about them on your blog. They're even more, um, suggestive on video than they are in photos. rental boat guy - Thanks, and see you on the shellfish flats! Martha - Geoduck. G-E-O-D-U-C-K. Geoduck.